﻿ The Klagan Regency Hotel, Kota Kinabalu | FROM $48 - SAVE ON AGODA! Have a question for The Klagan Regency Hotel? "Big rooms, comfortable beds with nice designed." "it is a good hotel with clean comfortable beds." The Klagan Regency Hotel is part of the 1Borneo Hypermall, set to become the largest lifestyle shopping mall in the area. All rooms come with a flat screen TV and internet access. 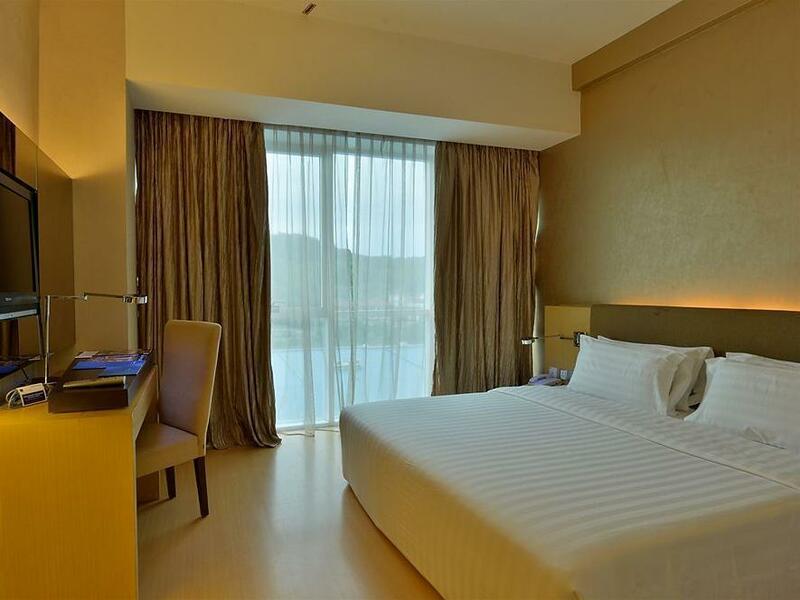 The hotel also caters to corporate travelers by offering a business center, three meeting rooms and a boardroom. 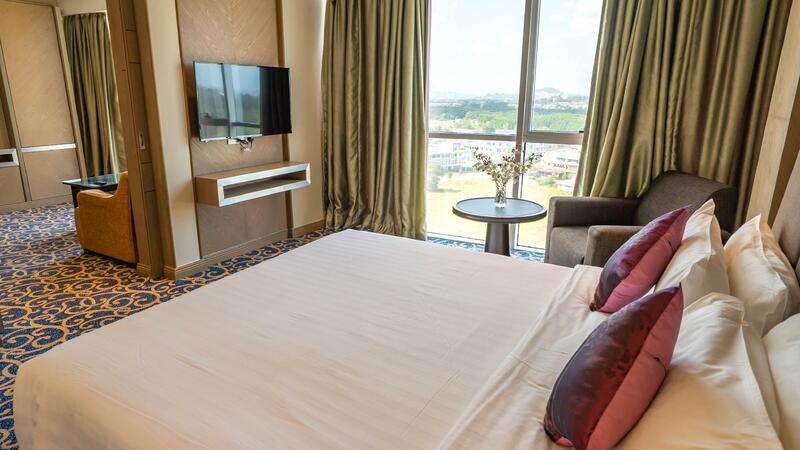 With its convenient location, the hotel offers easy access to the city's must-see tourist destinations. Shopping malls, street market, and handicraft market are just nearby the hotel. Additionally, the guests can enjoy exploring Kinabalu National Park, a World Heritage site in Sabah just 90 kilometers from the hotel. 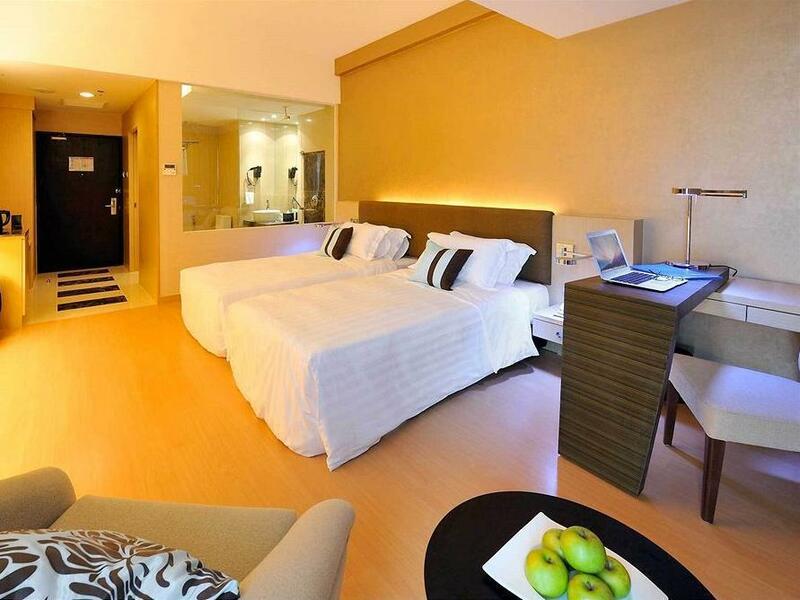 The hotel is also popular with visitors opted to climb the magnificent Mount Kinabalu. Enjoy fusion cuisine at the hotel restaurants or choose to dine in the comfort of your own room 24-hours a day. 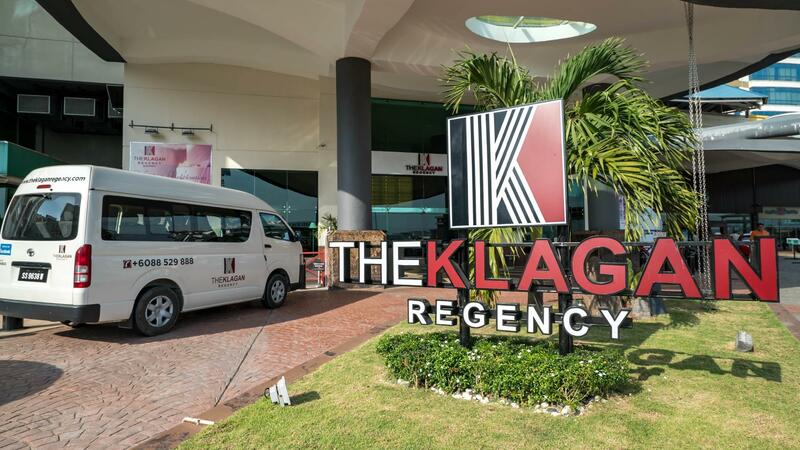 Maintaining high standards at all levels, The Klagan Regency Hotel will definitely make your stay a good one. "Breakfast spread are good, tasty food & cafe is very clean." Free parking are limited. Only given 4 space of parking spot (first come first serve), if full, need to park inside mall parking lot which cost a lot. Bath tub are dirty, aircond are very slow (complaint about it, no action given) and breakfast menu is not tasty at all, at least please provide omelette station. However, overall stay is ok as room rate consider cheap, but please invest more on breakfast menu. Value for money, easy to get anything your needs because this hotel were attached with the mall. The meals for breakfast is nice. But still has a thing should to change or improve is the equipment in the room. For example the remote tv is be can’t used. This small thing can influence your hotels service. Please take it as a good advice for your hotel improvement.. Thank you. The staff is friendly and helpful. Because it is a Christmas season, they provide a complimentary for us and a warmth writing card. Just they don't have a parking for visitor and we end up paying rm22 for the parking fee at the 3rd floor. Overall, everything is good. We will plan again for the next trip again. We are leaving in the early morning around 4am. I was parking my car in front the drop off zone to ease us to load our luggage around 3:15am. I spoke crystal clear that we are leaving soon around 4am. However, i was told by security at 3:30am that we are not allow to park the car temporary at drop off zone. I feel so unconfortable and just quickly pack my stuff and leave at soonest as we can. Besides, a staff (night shift) was just sitting at his desk and didnt help us carried our luggange bag. i somehow happy with my stay this time around, as compared to the previous one. main reason - the aircond! last time, even after numerous complaint, they dont fixed the problem (aircon not functioning). this time, somehow, they fixed it by not have to come to the room, just probably by switching on some switch, and the aircon cooled again! Love it but somehow the hotel screwed up my reservation. I booked for a deluxe king bed where there will bath tub included but to our dismay, the ours is without a bathtub whereby it is clearly stated in the description that bathtub and shower are included. Overall, it was a great stay. I could safely say, this hotel is one of our best we have ever stayed. Pros: - Staff are very friendly, very attentive & even call us to check and ensure our request were performed by them e.g request for extra towel, extra bathroom mat. - Breakfast spread are good, tasty food & cafe is very clean. Staff are also helpful. - Strategic location. Just next to a huge mall. Surrounded with variety of 24 hours marts - Live band performance at night! So there is no need to go to Hard Rock! Cons: - Building external look is worn out. I think they should re-paint it. - Room windows part looked a little worn out. - House keeping staff should change bed sheets, clean the floor on daily basis (especially if customer stays more than 1 night) & tidy up customer's items on desk or in bathroom to score excellent service. - Management staff who works in the office could have been more friendly if they see customers. It is near to shopping mall. Got upgraded for free for bigger room. High floor with good view and quiet room (at the corner). Breakfast is pretty standard. Comfortable bed. Good selection of TV channels. i check in on 21st dec. The bedsheet was dirty, it has blood stained on it. I am pretty sure they didn't change it. Parking lot also not sufficiently provided. i have to wait almost two hours to park my car near the hotel. Will not stay here again in future. They need to clean up the swimming pool. I have infected with red eyes for more than 3 days and still not recovering, I have to go to the clinic to get some medicine. Other than that, the first time we checked in it takes a while for the air conditioner to be fixed. The carpark is a bit inconvenient for the guest. The hotel doesn’t have car park, can either park at the roadside and pay or park using the season pass provided by the hotel at a rundown mall beside the hotel which I feel a bit unsafe to walk to the hotel at night. Nice clean hotel. The swimming pool is not as great as pictured, but still fine for swimming. 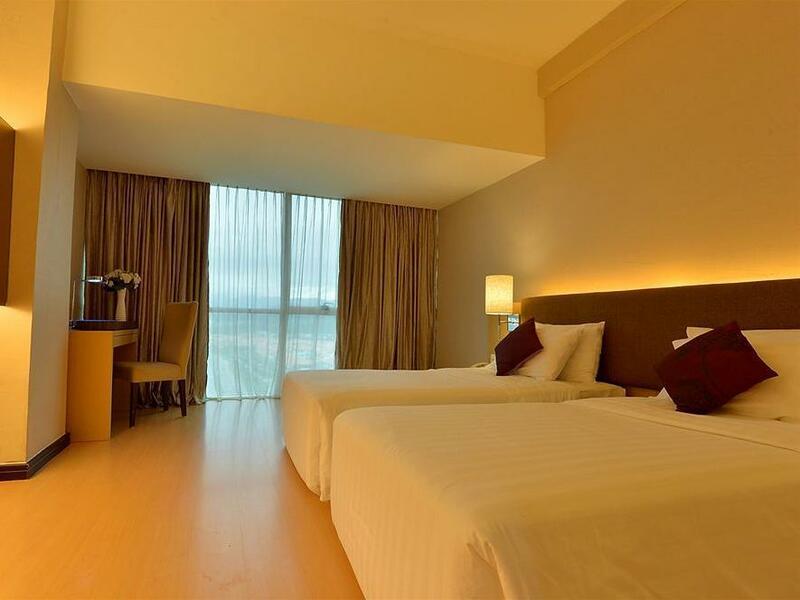 The room is spacious with nice bathroom with bathtub. You can get a parking pass with some deposit if you have car. Our stay was great. The location was within the shopping mall itself. We booked 2 rooms with connecting doors. Great for family with many children. Our room were cosy and with pool view. Our kids enjoy the pool since it was shade from the sun. The location is great. The view of cities seen clearly from my room. I just can switch of the light and open the curtains wide. Enjoying the night view of kk city from my room. The bed is comfort but the pillow smells weird. I dont know if the housekeeper change the pillow case or not. The toilet is clean and iron board, iron and hairdryer are provided too. i will come back and stay here again.